The tyrants of Saudi Arabia developed a plan that sells away Palestine. They see this as necessary to get U.S. support for their fanatic campaign against their perceived enemy Iran. According to the memo the Saudis are ready to give up on the Palestinian right of return. They forfeit Palestinian sovereignty over Jerusalem and no longer insist of the status of a full state for the Palestinians. In return they ask for a U.S.-Saudi-Israeli (military) alliance against their perceived enemy on the eastern side of the Persian Gulf. Negotiations on the issue were held between the Saudis and the Zionist under the aegis of the United States. Netanyahu and Trump’s “shared personal assistant, wunderkind Jared Kushner”, is the point men in these negotiations. He made at least three trips to Saudi Arabia this year, the last one very recently. Since the warnings, which could threaten the new Palestinian unity agreement signed by Fatah and the Iranian-backed Hamas in the Gaza Strip, Palestinian media displayed a rare degree of unity in recent days by coming out against Iran. The Saudi tyrant abducted the Prime Minister of Lebanon, Saad Hariri, and declared war on the country. The purpose of this move is to remove or isolate Hizbullah, the Shia resistance of Lebanon which is allied with Iran and opposes the Saudi plans for Palestine. On November 11 the New York Times reported on the U.S. drafting of a “peace plan” but provided little detail. The chance for such a plan to succeed was described as low. The document, which is being unveiled for the first time, proves all that has been leaked since President Trump’s visit to Saudi Arabia last May on the launch of US efforts to sign a peace treaty between Saudi Arabia and Israel. This was followed by information on the exchange of visits between Riyadh and Tel Aviv, the most important being the visit of the Saudi Crown Prince to the Zionist entity.The document reveals the size of concessions that Riyadh intends to present in the context of the liquidation of the Palestinian issue, and its concern to get in return the elements of power against Iran and the resistance, led by Hezbollah. To face Iran by increasing sanctions on ballistic missiles and reconsidering the nuclear deal, the Kingdom has pledged in the strategic partnership agreement with US President Donald Trump that any US-Saudi effort is the key to success. …Saudi Arabia’s rapprochement with Israel involves a risk to the Muslim peoples of the Kingdom, because the Palestinian cause represents a spiritual and historical and religious heritage. The Kingdom will not take this risk unless it feels the United States’ sincere approach to Iran, which is destabilizing the region by sponsoring terrorism, its sectarian policies and interfering in the affairs of others. First: The Saudis demand a “parity of the relationship” between Israel and Saudi Arabia. On the military level they demand that either Israel gives up on its nuclear weapons or Saudi Arabia is itself allowed to acquire such. The city of Jerusalem would not become capital of a Palestinian state but be subjected to a special international regime administered by the United Nations. The right of return for Palestinian refugees, who were violently expelled by the Zionists, would be given up on. The refugees would be integrated as citizens of those countries where they currently reside. Third: After reaching an agreement of the “main principles of the final solution” for Palestine between Saudi Arabia and the U.S. (Israel), a meeting of all foreign ministers of the region would be convened to back these up. Final negotiations would follow. Fourth: In coordination and cooperation with Israel Saudi Arabia would use its economic power to convince the Arab public of the plan. The point correctly notes “At the beginning of normalizing relations with Israel, normalization will not be acceptable to public opinion in the Arab world.” The plan is thus to essentially bribe the Arab public into accepting it. Contribute to counter any activities that serve Iran’s aggressive policies in the Middle East. Saudi Arabia’s affinity with Israel must be matched by a sincere American approach against Iran. Increase US and international sanctions related to Iranian ballistic missiles. Increase sanctions on Iran’s sponsorship of terrorism around the world. Re-examination of the group (five + 1) in the nuclear agreement with Iran to ensure the implementation of its terms literally and strictly. Limiting Iran’s access to its frozen assets and exploiting Iran’s deteriorating economic situation and marketing it to increase pressure on the Iranian regime from within. The U.S. plan for peace in Palestine is to press the Palestinians and Arabs into anything Israel demands. The Saudis will agree to that, with minor conditions, if only the U.S. and Israel help them to get rid of their nemesis Iran. But that is impossible. Neither Israel nor the U.S. will agree to a “parity of relationship” for Saudi Arabia. Saudi Arabia lacks all elements to become a supreme state in the Arab Middle East. Iran can not be defeated. Iran is the at the core of the Shia constituency and at the core of resistance to “western” imperialism. Shia and Sunni aligned populations in the Middle East (ex Egypt) are of roughly equal size. Iran has about four times the number of citizens the Saudis have. It is much older and cultured than Saudi Arabia. It has an educated population and well developed industrial capabilities. Iran is a nation, not a conglomerate of desert tribes like the desert peninsula under al-Saud. Its geographic position and resources make it unconquerable. 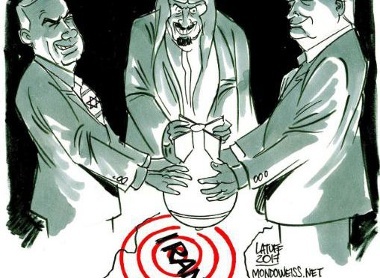 To defeat Iran the Saudis started proxy-wars in Iraq, Syria, Yemen and now Lebanon. They needed foot soldiers to win these wars. The Saudis hired and sent the only significant infantry they ever had at their disposal. Their hordes of al-Qaeda and ISIS fanatics were defeated. Tens of thousands of them have been killed on the battle fields in Iraq, Syria and Yemen. Despite a global mobilization campaign nearly all the potentially available forces have been defeated by the local resistances on the ground. Neither the colonial settler state nor the U.S. are willing to send their soldiers into battle for Saudi supremacy. The grant plan of the Trump administration to achieve peace in the Middle East is high on hopes but lacks all the necessary details. The Saudi’s promise to support the U.S. plan if the Trump administration is willing to fight their nemesis Iran. Both leaderships are hapless and impulsive and both of their plans have little chance of final success. They will be pursued anyway and will continue to create an enormous amount of collateral damage. The Zionist entity feels no real pressure to make peace. It is already dragging its feet on these plans and will try to use them to its sole advantage.